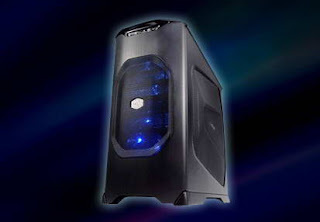 The Colossus is the latest high end desktop from Vigor and is the most powerful gaming desktop offered by the company. So what makes this desktop so powerful? How about the two Intel Core 2 Extreme QX9775 quad-core processors—that’s right, TWO! Do the math and you have eight core processors running at 3.2GHz speed on the Vigor Colossus! Whew! Why the need for that much processing power? Well, the Vigor Colossus can support up to FOUR graphics card. These graphic cards will allow gamers to run up to two XHD (2560 x 1600) monitors. As if eight core processors isn’t enough for you, how about 8GB of DDR2 memory with 800MHz speed? Dude, wipe that drool off your face, there’s more. With 8 processors, 8GB DDR2 memory and four graphics card, of course there’s a tendency for the Vigor Colossus to overheat, however, the exclusive Twin-Peaks Cooling system will allow the Colossus to run at full speed. So how much will the Vigor Colossus set you back? How about $6,799, and that’s just for the basic configuration which includes: 4GB DDR2 memory, 2 Terabytes hard disk drive, and two NVIDIA GeForce 8800GT graphics card. The full configuration of the Vigor Colossus will set you back a whopping $8,100! For that price you will get Western Digital Raptor 150 Hard Drives, two AMD Radeon HD 3870 X2 graphics cards, 8GB of fully-buffered DDR2 800 memory, high-fidelity audio by Creative Sound Blaster X-Fi, plus other components. Let’s just hope that for paying that much money they included a Blu-ray optical drive. The basic configuration of the Vigor Colossus only includes a DVD +/- RW optical drive and you have to add around $800 more for a Sony Blu-ray optical drive.